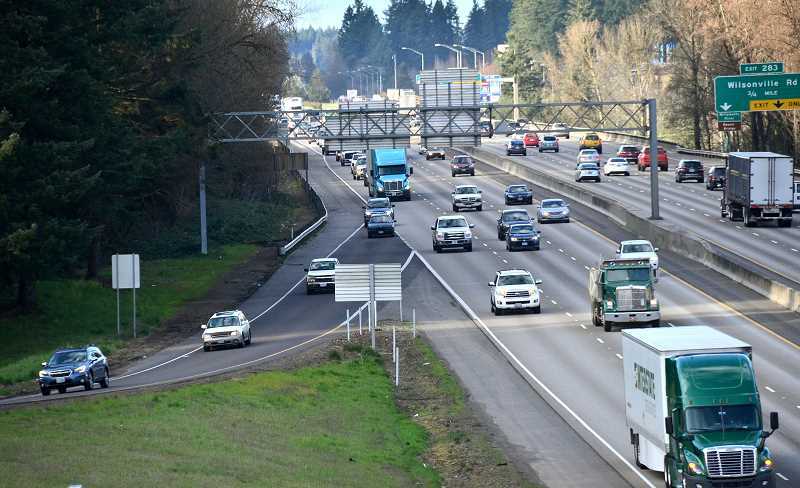 The Oregon Transportation Commission passed an amendment in July to add a project that would seismically retrofit Boone Bridge and build an I-5 southbound auxiliary lane onto the state's project queue. Wilsonville's I-5 Facility Plan, which was adopted by City Council in July, would potentially add a southbound ramp-to-ramp lane from the Wilsonville Road on-ramp to the Charbonneau exit off-ramp, an improvement based on studies conducted by Wilsonville and the Oregon Department of Transportation that determined the lane would significantly reduce congestion. It would also add retrofitting so that Boone Bridge could better brave a natural disaster such as an earthquake. The amendment added the project to the Oregon Transportation Plan, which includes a list of projects that have met the necessary requirements, such as public involvement, to be considered for funding. Wilsonville Public Affairs Director Mark Ottenad said the project would benefit highway flow and Wilsonville citizens. "The whole project could benefit both regional movement on I-5 for freight, commuters and through traffic. Then with I-5 flowing better local arterials like Wilsonville Road will operate better also," he said. The project still needs to garner funding from the Oregon State Legislature, a federal transportation improvement grant or other funding sources and is projected to be implemented between 2028 and 2040, though nothing has been finalized. Wilsonville hopes tethering the retrofitting with the auxiliary lane makes it more attractive to funding sources and easier to implement because the same contractors can work on both projects. "The City will work with others to lobby to try to advance this to a higher priority," Ottenad said. "The whole reason the project was adopted is a recognition that the I-5 Boone Bridge area is a major bottleneck that impacts the entire region. Coupled with that, the project also calls for seismic retrofit of Boone Bridge, which would help with resilience."